Born and educated in Germany. Has travelled in Greece since 1965. Resides and works on Naxos since 1974. In 1980 he became a Naxian Citizen. More than 100 One Man Shows and group exhibitions in Europe, U.S.A. and Asia since 1973. Curator for the PYRAMID PROJECT. Curated and organized the exhibitions for EMBROIDERED IMPRESSIONS ART FROM SOUTH AFRICA, John Rodgers, England, Francisco Sepulveda, Chile, Mette Rosenvinge, Denmark, Veronika Kranzpiller, Germany, Reg Warwick, England, Elodie de Pesters, France / Christina Tzannini, Greece, Rob Jacobs, Netherlands, Sevi Margaritis, Greece, Lidia Serafim and Janusz Petrykowski, Poland, the INTERNATIONAL NAXOS ARTISTS exhibition, BETWEEN ECO & EGO- INTERNATIONAL ART EXHIBITION, Naxos, Greece Introduction and organisation for Wolf Bröll's sculpture project ARIADNE. Organisation for the concerts of the SIRIN CHOIR MOSCOW and the UNIVERSITY CHOIR TUEBINGEN. 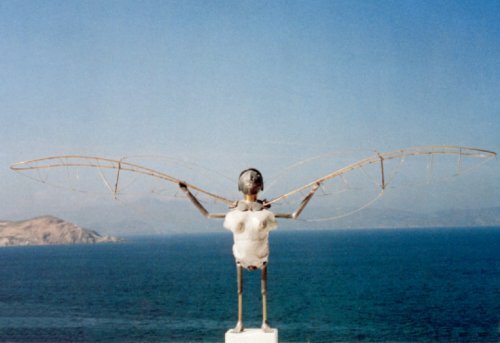 Copyright 2009-2012 Klaus Pfeiffer: Artist, Sculptor, Painter, Naxos, Greece. All rights reserved.